Live Translation feature detects the language of your visitor messages automatically and translates those message to the language that agent understands. Your visitor's can chat in their own language. This feature is available on Mighty and above plans. 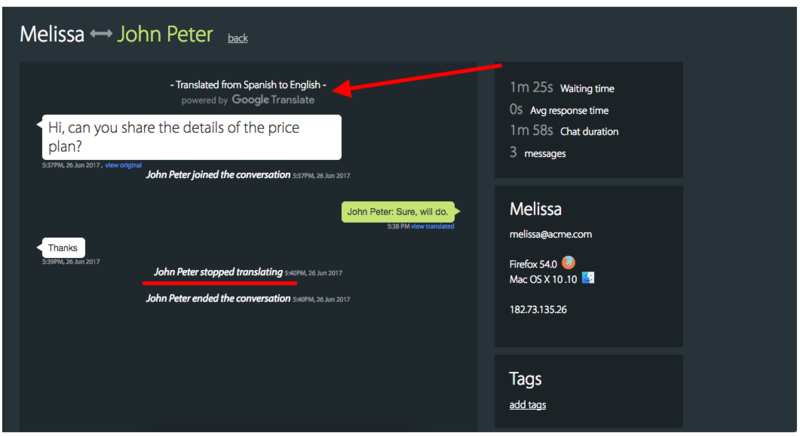 Agent can set the desired language to which visitor messages should be translated during an ongoing chat. Note: If you have installed HappyFox Chat widget on multiple websites, you can choose and set your desired language for each of your profile. You can go to Manage page and click on `Timezone and Language` from the sidebar.Select the desired language. Note: We use Google's Translate API to translate the messages. Once the agent clicks the 'G translate' button, the visitor's message will be translated to the language set by the agent. Agent can view the original message/translated message by clicking the 'View Original' or 'View translated' hyperlink present beneath the agent and visitor's messages. If you don't want messages to be translated, click on the 'Globe icon' button and click on Yes button. 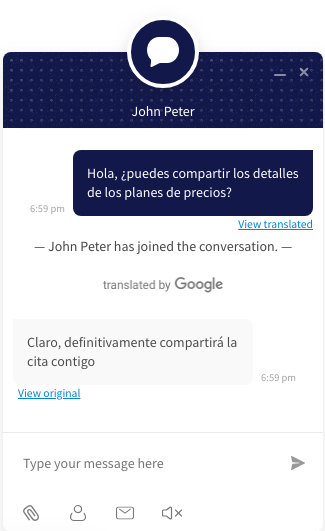 Agent's chat messages will be automatically translated to the visitor's language. Visitor's can click the original message/translated message by clicking the 'View Original' hyperlink present beneath the support agent and visitor's messages. The chats will be stored and displayed in the translated language(Profile language). Details like when the agent has stopped Translation will also be displayed here. If you've integrated your HappyFox Chat account with apps like HappyFox HelpDesk, Pipedrive, Microsoft Dynamics, Salesforce and Zendesk, then the translated chat transcripts will be posted to those connected apps.